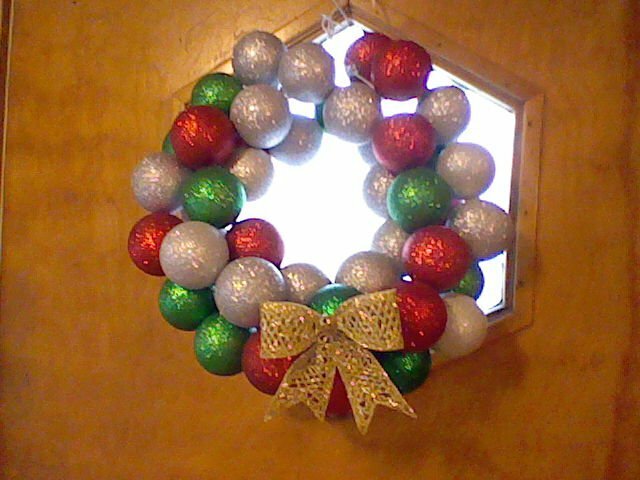 Not the best pic, but here’s my homemade wreath. I got the idea from Crap I’ve Made. I think this totally works in the Homey Goodness Challenge for “do something creative” and “decorate for the season”. I love the glitter ornaments. It would have been bigger, but after I purchased the ornaments, then ran out- twice! I went back to three stores and none of them had anymore dark green ornaments. They only had the light green. Ugh. I know it’s in style, but I didn’t want to have to start all the way over again, and buy even more ornaments. Does that make me a bad crafter?! Still love it. I still haven’t trimmed the hanger at the top either…work in progress, almost done.